In this case the word big is just not enough. Regina's fourth Walmart is located just west of the Lewvan and south of Regina's airport on the newly developed subdivision of the city which can only be described as a sprawl. I want to tell you about the Walmart but before I do I should mention something about the new subdivision. The Lewvan is the throughway that pretty much defined the west boundry of the city south of the CPR mainline. The only thing west of this thoroughfare was the Regina airport which has always been an outstanding airport to approach and depart from because the airport is close to the city but nicely separated from the city. The decision to expand Regina west of the Lewvan and south of the airport is an interesting one but it is ever so clear that some really thoughtful planning has gone into laying out this residential and commercial portion of the development. Most of the streets and infrastructure have been installed so the housing and other construction is in what is essentially a fully developed portion of the city. Huge wide streets and well thought out arrangement of residential and commercial areas is really impressive. 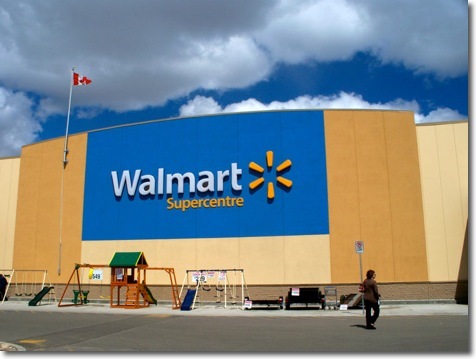 Walmart's move into the "Supercentre" concept of a retail outlet is an interesting one. In Canada Loblaw's Westfair Foods operating the Superstore chain dominate the mass food market. Only three other players are in the market in Manitoba and Saskatchewan those being Sobeys, Safeway and Interprovincial Co-op. Though the profit margins on food stores is very thin the volume is attractive and has gross profit written all over it day after day after day. Unlike other forms of retail which are so seriously season food is all the time. Another interesting factor in general merchandise retailing in Canada is that the Walmart tsunami just didn't happen the way it did in the United States. The Canadian market place is different and despite Walmart's proliferation Zellers and Canadian Tire have been definitely holding their own and growing. So it has just made sense for Walmart to diversify and move into the mass marketing of food. In their other stores in Saskatchewan they have food departments but these are relatively small and only marginally competitive with Superstore's minor league Extra Foods. The floor size of the Walmart Supercentre is truly on the very big scale. 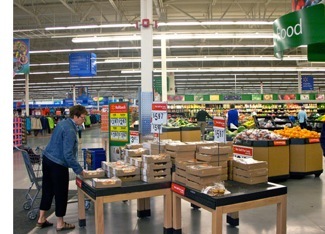 The store has the usual Walmart stuff but in an "L" shape along the east side and all along the north side of this giant structure is its food department. In most ways the food department is similar in approach to its other retail sections. The variety and stock is not overwhelming and is actually smaller than Superstore. A person would have to be a much more experienced shopper than my father and I as we went through the store but we only saw a few things that looked close to being bargains. There lost leader specials in meat looked good but not spectacular. 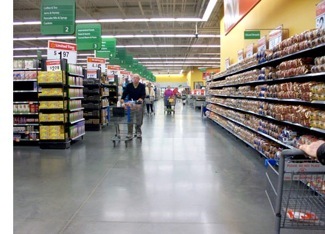 As for the rest of the store what we saw was the standard kind of thing you see in any Walmart with no greater number of actual items but a lot more spacious with more floor showing. Were I living in Regina and had this as an option to the other food outlets in the city I doubt if I would change my shopping pattern from visits to Superstore, Extra Foods and the occasional visit to Safeway. Check out was slow and the vast distances from produce to dairy would make regular shopping unlikely. In this discussion I have not compared shopping at another mixed merchandise outlet, Costco. In Many ways Costco and the Walmart Supercentre are comparable, even their layout has some similarity. However, they are two very different things. Costco with its annual membership fee and general inconvenience is a place for specialty shopping and may not be cost competitive with other mass food outlets. Costco is really an oddball operation and as such hard to compare. We don't have a membership and if I lived in the city I would not get one.